I'M DEFINITELY MORE inclined towards savoury smoothies (namely my peanut butter and banana smoothie) but some days I want a fresher taste and an extra hit of fruit and veg in my morning. I tried this and believe me, it is hard to resist! The kids loved it too so a win all around! OH AUTUMN, I just love you. Every year, by the end of the summer I am always so excited for all the root vegetables and stews and crockpot type meals again. We try to take a cue from “French Women Don’t Get Fat” and eat local and what is in season, so in the summer that means all the salads and lighter meals. Come the fall we dive into the heartier meals that feel like home. Eating what is in season also makes me really excited for the colder weather, even though I don’t love winter, because there are so many amazing foods that come with the colder weather. Truth be told I normally hate stew, but that was before I learned how to make it like a pro! This stew is my adapted recipe from Michael Smith’s Beef Stew. There are a few tricks to make your stew next level. The first is to cut all the meat and veg to roughly the same size. I find that 1/2 inch cubes are my perfect size, but do whatever size works best for you. The second tip, which is A MUST, is to sear your beef on all sides before you begin. THIS is the trick to delicious and moist beef that falls apart and melts in your mouth. The third is to cook the vegetables in two parts. Half goes in right at the beginning to dissolve into and flavour the stew, the other half goes in thirty minutes from the end to give a great colour, shape and texture to your stew. Pat the beef dry and cut into 1/2 inch cubes. Place in a bowl and add a 1 tbsp flour, add salt and freshly ground pepper and toss together until the beef is evenly coated. Add oil to pot, enough to create a thin film across the bottom, then add your beef to just cover the bottom without stacking on top of each other - even if this means doing it in batches. Sear meat on all sides, taking the time to allow the beef to brown on all sides. It takes time but the caramelized flavours are the secret to fantastic stew! (If you’re doing it in batches take the meat out as it is done to avoid it burning). Put the beef back in the pot, add half of your vegetables, the tomatoes, wine and beef stock. Add the bay leaves and rosemary and bring the pot to a simmer. Cover and simmer for about an hour, until the meat is almost tender, then add the other half of the vegetables and the barley and continue to cook for another thirty minutes or so until meat is tender and vegetables are cooked through. Season to taste and devour. Step 1: Admire whole mango in all it's glory. Step 2: Cut mango into thirds. Holding it lengthwise, cut the mango about 1/4" from the center line (or from the little stem) avoiding the pit if you can, repeat on the other side. You should be left with three pieces, two halves and the centre piece with the pit. 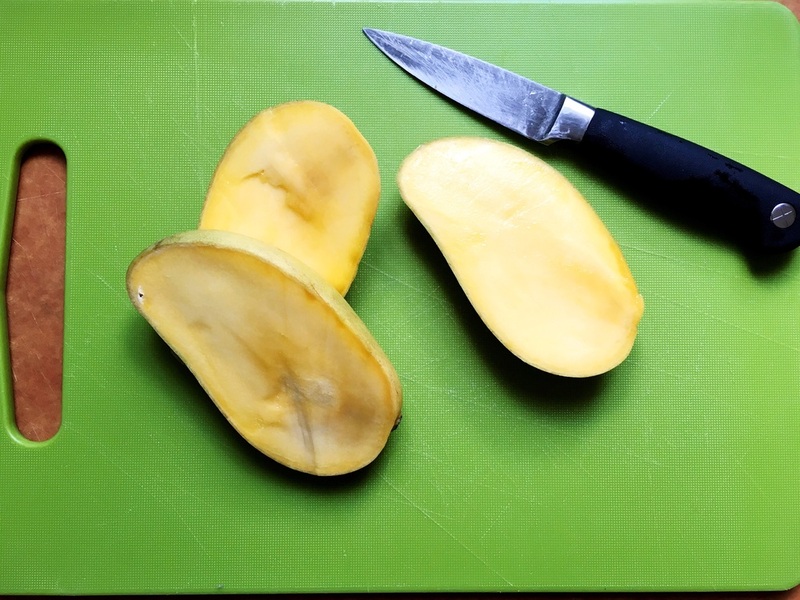 Step 3: Cut horizontal slices across the mango without cutting through the skin on the opposite side. Cut vertical slices across those to create cubes. Invert mango slices so your mango looks like a hedgehog. Step 4: Carefully cut the cubes off of the inverted mango skin. Peel the skin off of the center piece and cut any remaining bits mango off the pit. Step 5: Feed your mango lovin' bubba. "Mennnnnngoh"
FOR THOSE OF you who don't know my son Finn, you should know that he is obsessed with oats. The first thing he says to me when I go to get him in the morning, every morning, without fail, is "oats". Sometimes I opt to make a big batch of oatmeal and keep it on hand for a few days, other times its last minute oats in the morning and he hates waiting for them to cool down since he wakes up starving. So lately I have been tinkering around with overnight oats and i made these and they are a WIN. While eating them for breakfast Sam told me they were the best ones I've made yet. If you are planning on using protein powder to up the heartiness of these oats I highly recommend using Canadian Protein's "Grass Fed New Zealand Whey Isolate" in milk chocolate or vanilla. Milk chocolate is my all time fave but the vanilla is also delicious, particularly in my protein power balls. Blend up the pineapple first so you have a juice base. Combine all other ingredients together and blend until smooth(ie). See what I did there? SINCE WE FOUND out that Finn had a milk protein allergy we made huge adjustments to how much dairy any of us consume. Even now that Finn is no longer breastfeeding and can eat some dairy (butter and cheese) he still is sensitive to cow's milk. Once we realized that cow's milk was an issue for him I began to try different alternative milks and discovered that we all really enjoy almond milk. The problem though is that we go through so much of it and at two $4-5/2L a week we were starting to go through a lot. So I began to play around with different recipes and portions and I came up with a winning solution that ends up being cheaper than purchasing cows milk or store bought almond milk. I ordered this bag of almonds and at $19 for 8 cups of almonds this will make three litres of almond milk a week for a cost of roughly $2.30. You can't beat it - we use it for everything from smoothies to cereal to baking to a substitute for milk in any recipe really. If you are looking for a blender and have a hard time shelling out $700 for a Vitamix , we have been SO happy with our Blendtec , I really can't say enough about it. Plus, it's blades aren't sharp to the touch which is extra comforting to know when Finn wants to help make his daily smoothie, I can let him help put the ingredients into the blender without worrying. A MONTH AFTER Finn was born we discovered he had a milk protein, or "casein" allergy. I learned this after I ate a lot of dairy one night and woke up to blood in Finn's stool the next morning. As a new mother I felt terrible, knowing that something I have full control over something that caused my poor one month old babe to be in pain. So from when Finn was one month old until he was about 10 months I eliminated dairy from my diet. This was a huge challenge for me since I love cheese so much. It was extra hard since you have to avoid a lot of cheese's (any unpasteurized) when you are pregnant due to the risk of listeria. Initially it was tough. Eating out is a huge challenge since there is butter and milk ingredients in almost everything. Same with most snacks... did you know that a lot of chips have milk powder in them to make the flavour stick to the chip!? Who would have guessed that my beloved ketchup chips were covered in milk powder? Eating in was a challenge since we spent the first three months of Finn's life living with our families as Sam's job required us to be in Ontario. It was such a blessing to not have to cook and to be able to just relax with my newborn but I felt bad that I was requiring special meals or for everyone to eat dairy free. After about a month things got easier and by two months I knew what I could and could not eat, I was not craving chocolate or cheese as much and things felt dramatically easier. I learned how to sub out dairy ingredients like butter or milk while cooking or baking for vegan alternatives like Earth Balance butter and/or baking strips, or almond milk. Or I even discovered that Costco's chocolate chips don't contain milk! They use soy lecithin instead so I was able to use these as a substitute for the odd cookie craving. More importantly than just finding that things got easier I found that I was eating significantly better and actively pursuing a healthier lifestyle in general. I had way more energy, the extra baby weight came off really quickly and I didn't crave junk food or sweets anywhere near as often (the cookies were often made as per my husband's request ;) ). I invested in some incredible cookbooks that are either vegan or have mostly dairy free meals in them which made this process so much easier. Gwyneth Paltrow's It's All Good is probably my most used cookbook and is fantastic. I've yet to try a meal that I haven't loved. Not every dish is dairy free but she always includes the dairy free alternative. I also got a copy of The Oh She Glows Cookbook which is really great. I especially loved the dessert options in this cookbook when Christmas time came around and I wanted to be able to indulge in some delicious dairy free sweets. As a result of spending nine months avoiding dairy, our family's eating habits have changed dramatically and have continued to change even though Finn has weaned himself and I no longer have to monitor my dairy intake. (Side note: Finn still gets a bit constipated with dairy so we avoid it as much as possible, although his reaction is not as severe and nothing a few prunes can't help!) Sam and I eat vegetarian/vegan at least four times a week, which has freed us up financially to justify purchasing beautiful 100% responsibly sourced fish from our local fish monger once a week and organic meat once a week. Not only do we feel better and have more energy, I love that I can teach my son and future children to love vegetables and to appreciate great produce, fish and meat that are interesting and healthy. HERE ARE A few of my favourite things links from this past week. Genius kitchen designs. I have a dream to design a custom kitchen for myself one and this article was so inspiring! To accompany my goals for 2016, and the January Cure, this is a practical list to keep our home clean for 20 minutes or less a day for 30 days. This post about Raising Foodie Kids is amazing, and I totally am on board with it. A great video of Adele and James Corden doing Karaoke together. I loved this tribute from one of my favourite artists, Brooke Fraser, to David Bowie after his death. Emily Blunt and John Krasinski listed their beautiful home and I have been swooning over the pictures. One of the things I miss most about Montreal is their amazing chicken shawarma (shish taouk). This chickpea shawarma salad looks amazing and like it may just curb my cravings.